Paris. One tends to fall for this city instantly. She mesmerises you with her history, language, urban planning, museums, monuments, grand boulevards, river, bridges, fancy parks, art & design, cuisine, cafés, bars, lights, multiculturalism, attitude, charm, conversation... It's an inexhaustible list. Below all this magnificence however, is another masterpiece. A web built over 100 years ago, that serves 4-5 million Parisians to commute daily. 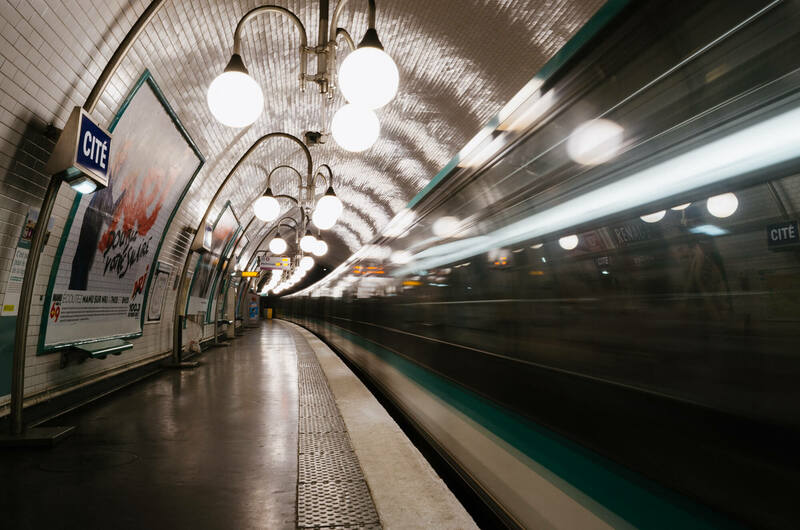 The Paris Metro is a symbol of the city- noted for its high density and uniform architecture, influenced by Art Nouveau. It is mostly underground, 214 kilometres long and has 303 stations. Today, there are 14 lines. 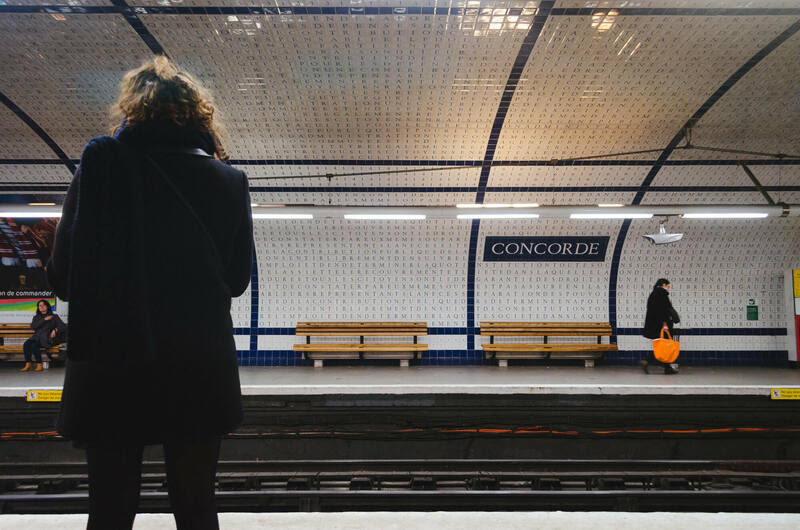 Working at Intégral Ruedi Baur, I had the opportunity to be a part of the 'passenger information: system design' for Grand Paris Express, the upcoming metro extension for greater Paris. Working on this project kindled in me a certain affection and respect towards the existing metro system. 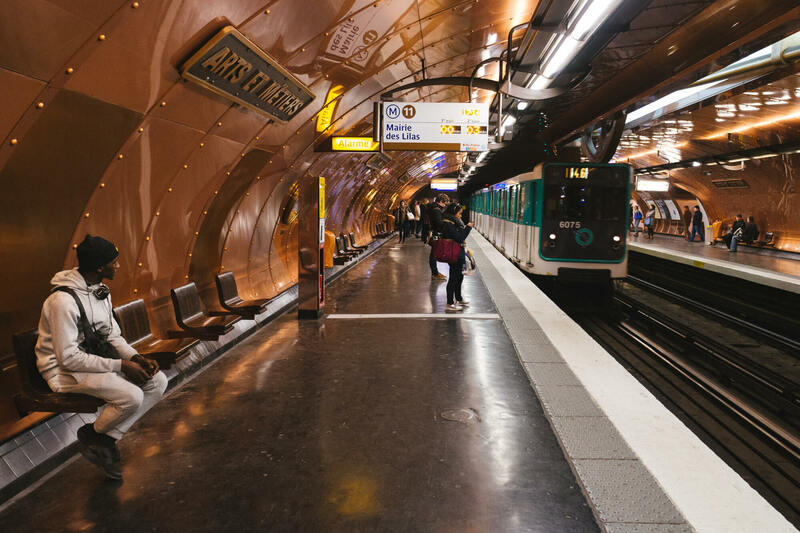 In the world of design, one hears a lot about the NYC Subway or London Underground, and Paris is left behind. 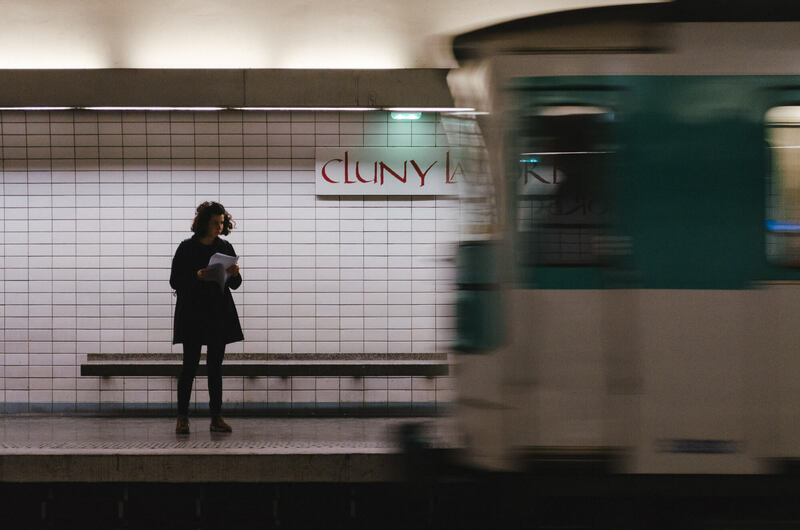 I decided to photograph select iconic Paris Métro platforms, to capture and share what I had grown to adore so much. Albeit underground, the system encompasses the city's culture & exhibits historical transformation. 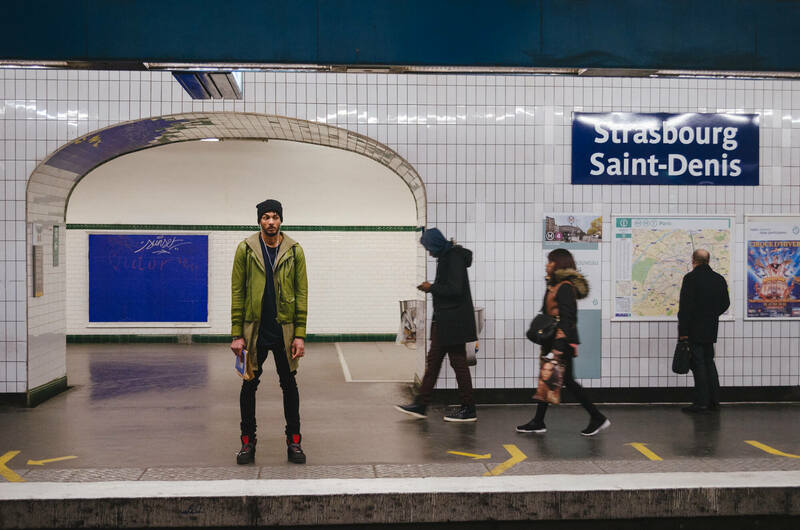 Being a creative El Dorado for ages, Paris has always had great minds working on it's underground experience. From the original plain white tilework and art nouveau entrances, station decoration has evolved with successive waves of building and renovation. 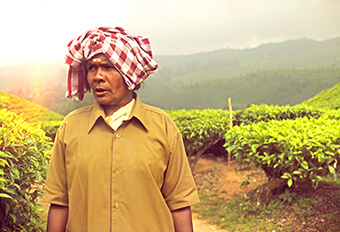 When in transit, one can truly cherish this mélange of styles. 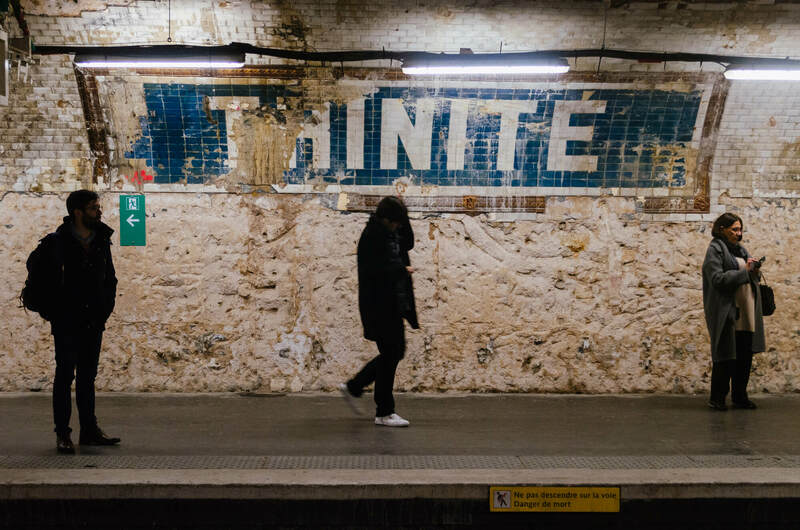 In this photography project I've attempted to present each chosen station in it's true character, and hope you're transported to Paris, underground. 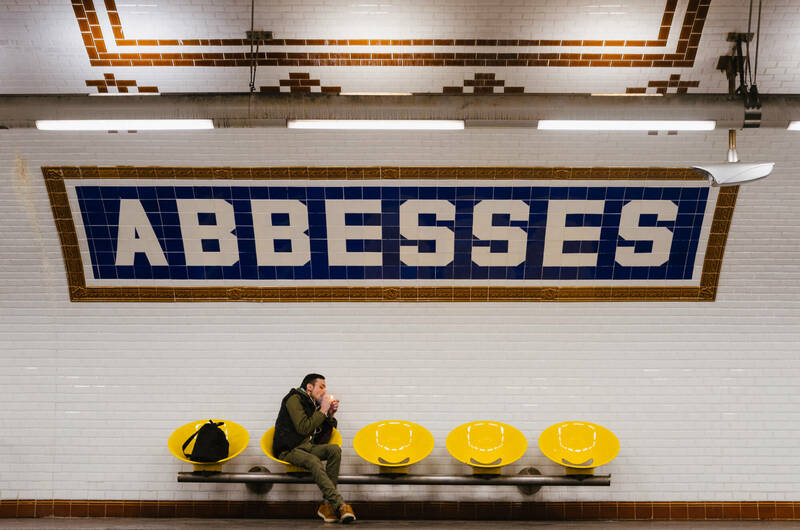 36 metres below ground, Abbesses is the deepest station in the Paris Métro, near Montmartre. The station was opened in 1913 on line A (now line 12), in the 'Nord-Sud' style. 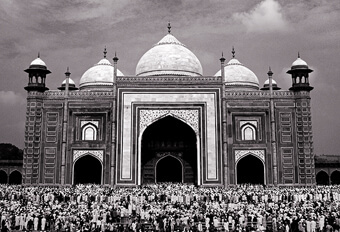 It has been recently restored to former glory featuring: white beveled tile walls, decorative coloured elements, and most impressively the large mosaic grid-based title. Arts et Métiers (line 11), site of the 'Arts and Crafts' school, is clad strikingly in copper to evoke the Jules-Verne-like interior of a submarine, a design by comic-book author François Schuiten. It was executed in 1994. 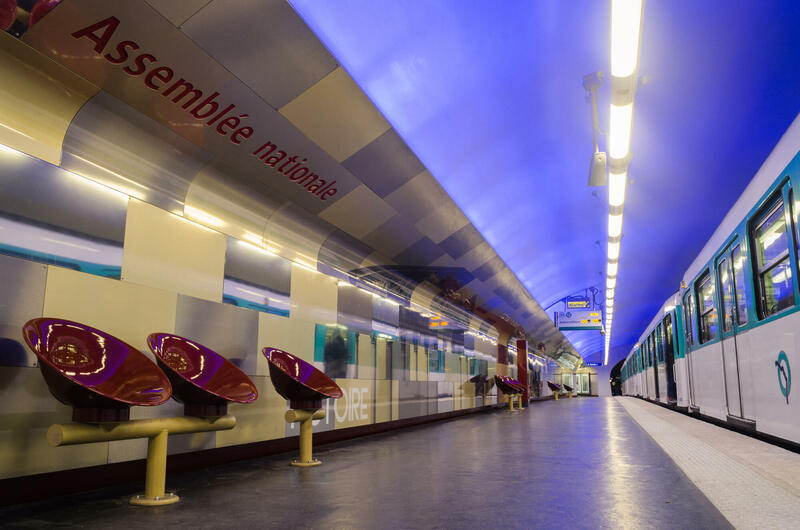 Assemblée Nationale (line 12) has no advertising on the station walls. The decoration, a tribute to the deputies, is changed with each legislature. 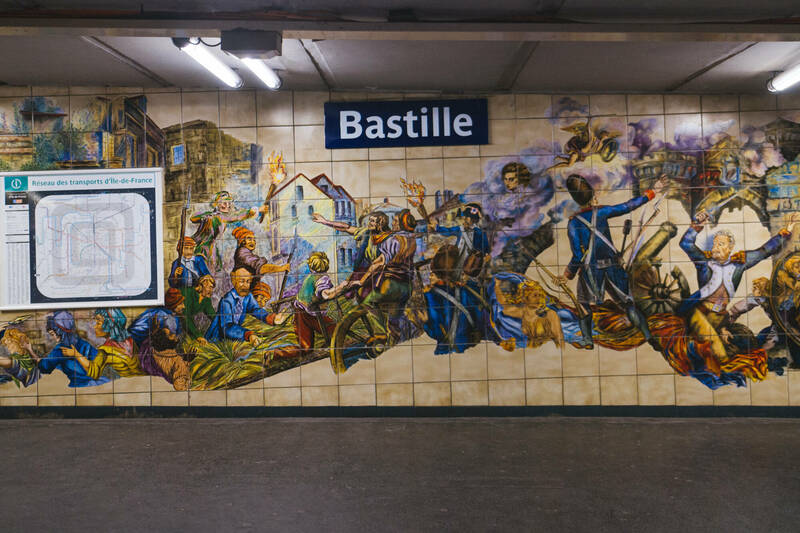 Bastille (line 1) features murals of scenes from the French Revolution. Bir-Hakeim is an elevated station of the Paris Métro serving line 6 (mostly above ground), providing best access to the Eiffel Tower. It's situated on the left bank of Bir-Hakeim bridge over the Seine. The name of both commemorates the World War II battle of Bir Hakeim. Cité (line 4) lies underneath Île de la Cité, one of two islands on the Seine at the geographic centre of Paris. The only station on the islands, it lies near many famous landmarks, such as the Cathedral of Notre Dame. Concorde (line 12) is completely tiled in the text of the August 1789 Declaration of the Rights of Man and the Citizen. The scheme was designed by Françoise Schein and executed in 1991. It was originally opened in 1910. 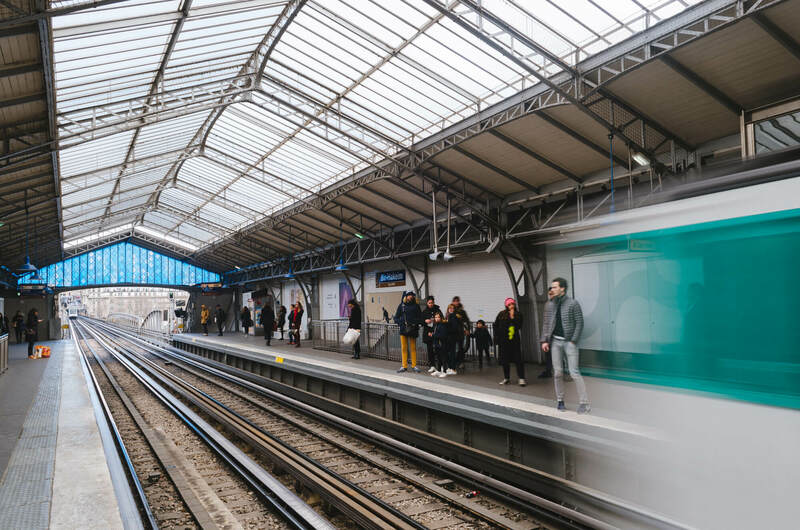 On 21 March 1948, when the RATP in charge of transportation within Paris was created, the modernization of the network had become a necessity. This consisted of renovating stations by applying sheaths of metal paneling (known as carrossage) along the sides of the stations, hiding the aging tilework. This proved to be cheaper than refurbishing the tile and increased advertising space. 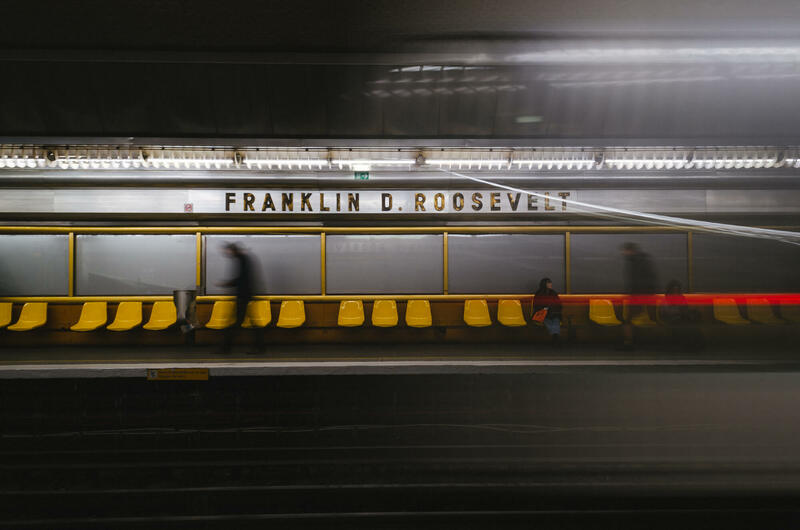 Franklin D. Roosevelt (line 9) received the first paneling makeover. 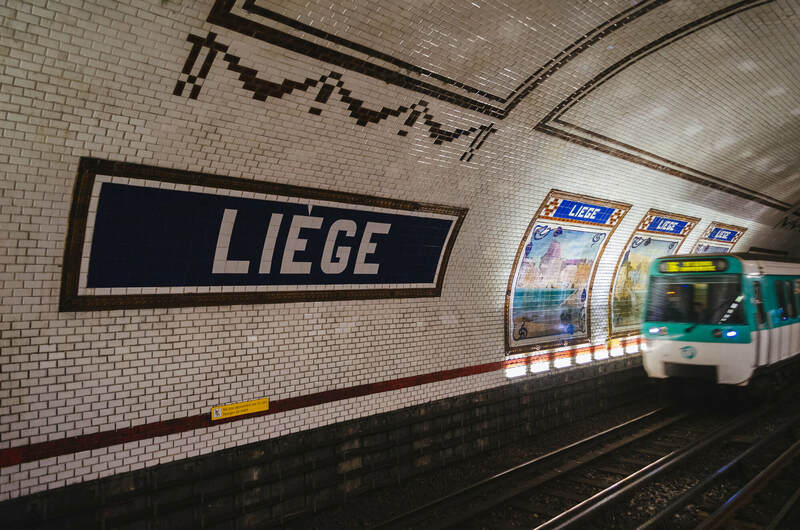 Liège (line 13) has tile mosaics inserted into the former advertising frames featuring scenes of various locations in the old ecclesiastical principality of Liège. They were offered to Paris as a gift by Belgium in 1982. 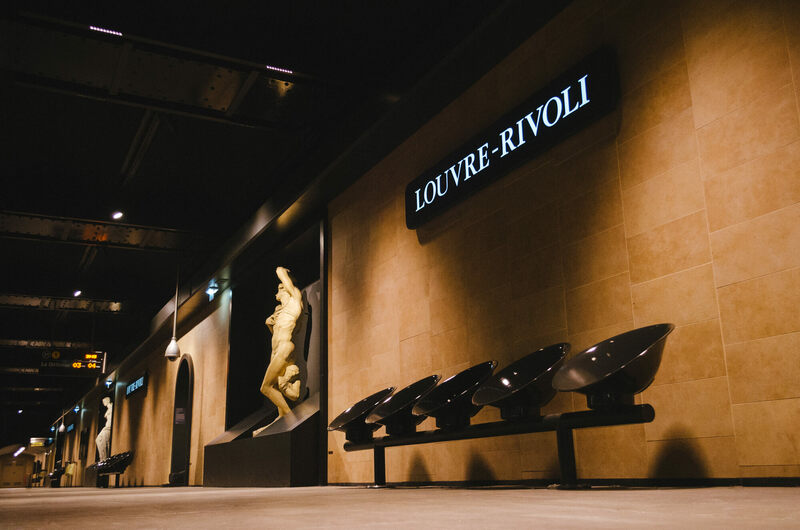 Louvre station (known since 1989 as Louvre - Rivoli) was the first station to receive a cultural makeover, in 1968. It features faux stonework & replica statues under subtle lighting, which together turn the station into an antechamber of the Musée du Louvre. Pont Neuf station is is named after the city's oldest bridge, Pont Neuf. It opened in 1926, designed in the Andreu-Motte style. 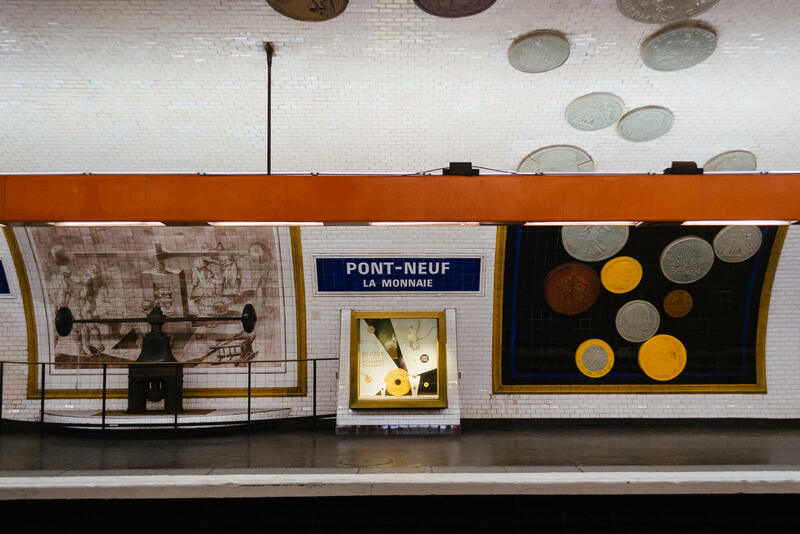 On the station's platforms are large reproductions of various coins, representing the Monnaie de Paris (Paris mint), located nearby. The platforms also have a screw press for coining and two windows showing real coins. Strasbourg Saint-Denis station (line 4) is an example of the current Bruno-Gaudin style. The style, which focuses on maximizing the amount of light in the stations and hiding unsightly fixtures, returns to the classic, tried-and-true, beveled white tile. It also demonstrates 'Parisine', the typeface designed in 1997 by Jean-François Porchez, which replaced 'Métro Alphabet' by Adrian Frutiger. Trinité is one of the stations on line 12 whose Nord-Sud tiling (like Abbesses, above) is intact but had been covered over and hidden from view since renovation in carrossage style in the 1960s. I was fortunate to view this original exposed section dating around 1920, due to platform renovation work. 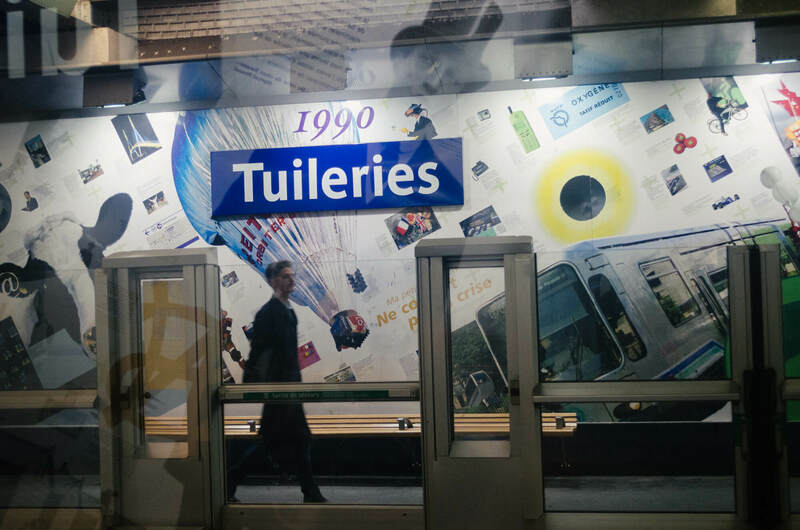 Tuileries (line 1) presents 20th century history and culture.